We recently published a protocol on Single-step Precision Genome Editing in Yeast Using CRISPR-Cas9. This protocol can be used to precisely modify any location in the yeast genome (essential or non-essential) without the need for intermnediate strains carrying antibiotic or auxotrophic markers. We successfully demonstrated the protocol in our recent publication Systematic Bacterilazation of Yeast Genes by functionally replacing essential yeast genes with their bacterial or human orthologs. This protocol can be used to add N-terminal or C-terminal tags and introduce site-specific muations in yeast genes using appropriate repair templates (HDR-Homology Directed Repair) or simply just randomly mutating yeast genes (via NHEJ-Non-Homologous End Joining) without any repair template. Welcome! Mudabir Abdullah, a Masters student from the University of Kashmir. He did his post Master’s Research fellowship at the Indian Institute of Science, Bangalore under the supervision of Prof. Sandhya S. Visweswariah. Welcome Mudabir! Welcome! Brittany Greco, an undergrdate in Cell & Molecular Biology, joined Kachroo Lab. Kachroo lab is looking for talented graduate students. The selected candidates will be supported by funding from the Faculty of Arts and Sciences at Concordia University. The prospective students will work at Canada’s first Genome Foundry for Synthetic Biology research. Check the advertisement here. And follow the instrutions for application here. In June 2017, we published our work on systematic bacterialization of essential genes in baker’s yeast in eLife journal. 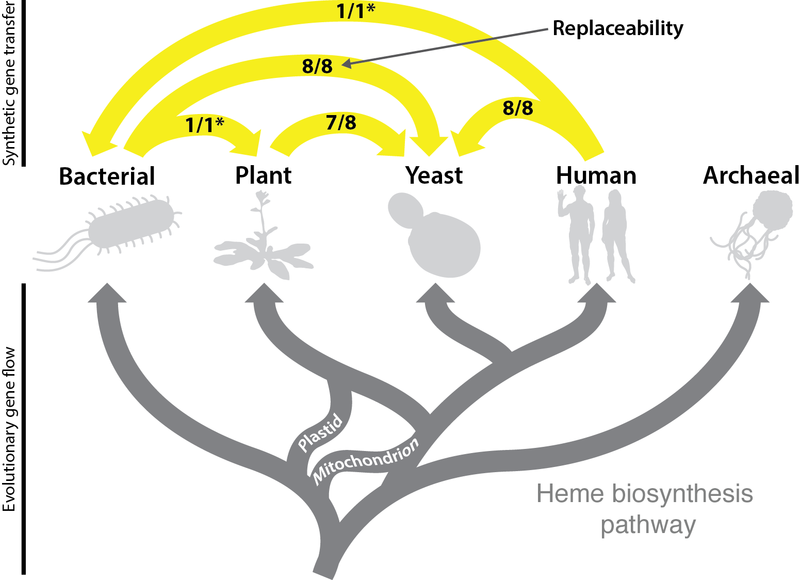 This work showed that many essential yeast genes can be replaced by their bacterial counterparts, despite over 2 billion years of evolutionary divergence between prokaryotes and eukaryotes identifying ancient heme biosynthesis as a universally swappable pathway. This work was highlighted even before publication at Science News, The Daily Texan. A simplified description of the work is available at eLife digest. 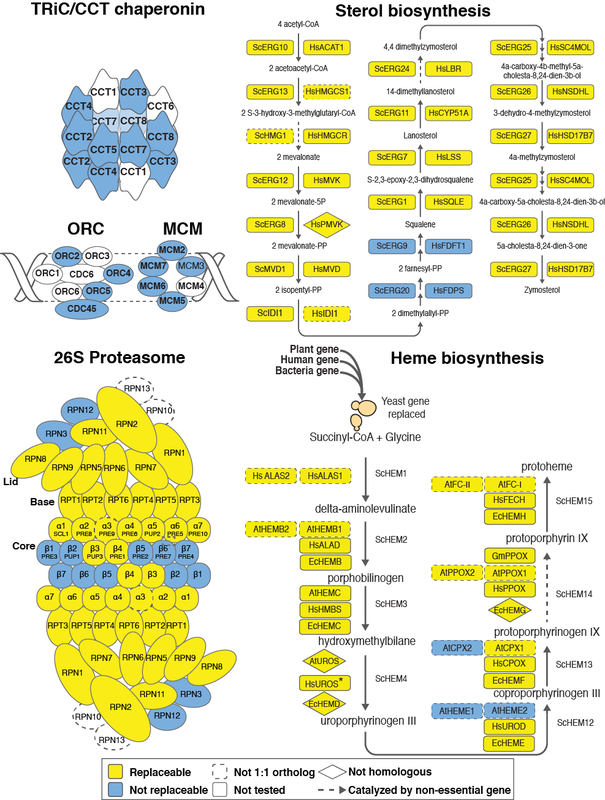 In 2015, we published an article on systematic replacement of essential genes in baker’s yeast with corresponding human orthologs. This work demonstrated that nearly 50% of the essential yeast genes can be replaced by their human counterparts, despite over a billion years of evolutionary divergence between humans and yeast. We discovered that metabolic pathways and protein complexes were either entirely replaceable or not. My lab at Concordia university will expand on this work to fully humanize genetic systems in yeast. The UT Austin press release on this study is available here, and Science Magazine published a news feature on this study here.